Eurotour 1998: France (Normandy, St Malo, Coutances, St Lo, Paris, Euro-Disney) and England (Swanage). Eurotour 2007: Germany and Switzerland (Bulach, Bensheim, Solingen, Berlin, Halle am Saale). Euroutour 2014: (Germany, Belgium) and participation in the IFCM 8th World Choral Games - Riga, Latvia. ​Eurotour 2016: (Belgium) Participation in the 64th European Music Festival for Young People - Neerpelt, Belgium. The South Cape Children's Choir is a proud product of the International Children's Choir Movement that began in the 1800's when girls were accepted into boys' cathedral choirs for the first time, and reached our shores in 1967 with the founding of the Pretoria Children's Choir. 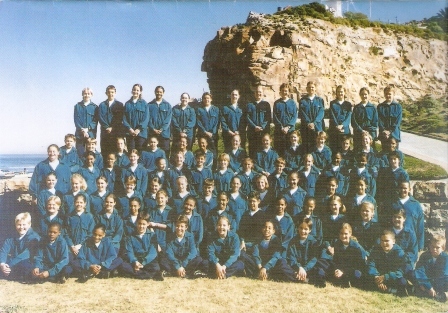 There are currently approximately 15 children's choirs active in South Africa, including the Tygerberg Children's Choir, the Eastern Cape Children's Choir, the Cantare Children's Choir, the Erkhurhuleni Children's Choir, the Jakaranda Children's Choir, the Magaliesburg Children's Choir, the Pietermaritzburg Children's Choir, the Kimberley Children's Choir and the Bloemfontein Children's Choir. Owing to need for the development of a culture of music in the Southern Cape in the 1990’s, the South Cape Music Academy (SCMA) was founded by Prof. Wynand Mouton, Dr Dries du Toit, Freude du Toit, Prof. Willie v.d. Westhuizen, John Theodore, Dr Ronel van Aswegen and Louis van Rooyen. At this stage Andries van Schalkwyk, principal at Outeniqua Primary School, (previously chairman of Eastern Cape Children’s Choir) was already busy forming a regional choir in the Southern Cape. The SCMA became aware of this and contacted him, requesting that he become a member of the Academy and to establish this choir (South Cape Children’s Choir - SCCC) under their umbrella. This was done, but a few months later strategic members of the SCMA relocated and the Academy was dissolved, resulting in the SCCC to continue functioning under the leadership of the SCCC Committee. 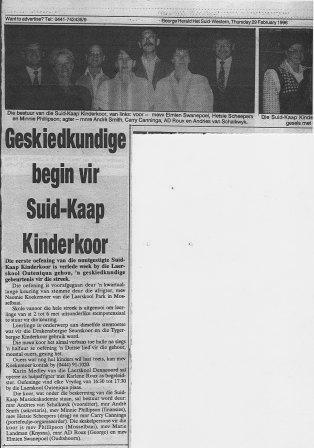 The founding SCCC Committee was: Mr Andries van Schalkwyk (principal of Outeniqua Primary School) (Chairman), Mr Andre' Smit (George Municipality) (Secretary), Mrs Minnie Phillipson (Mossel Bay) (Finances & Marketing), Mrs Hetsie Scheepers (Mossel Bay) (Uniforms), Mr Carry Canninga (George) (Organiser), Ms Elmien Swanepoel (Oudtshoorn) (Marketing), Mr A.D. Roux (George) (Marketing), and Ms Marie Landman (Knysna) (Marketing). 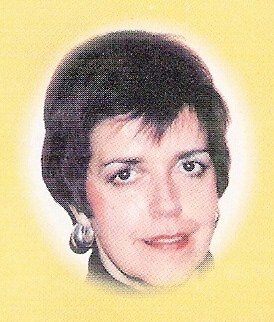 Andre Smit resigned with immediate effect and Anne Swart was co-opted in 1996. Naomi Koekemoer (Park Primary School, Mossel Bay) was the founding conductor. 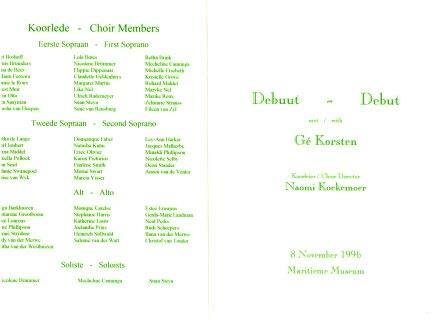 Kalene Roux was the choir's first accompanist. Karin Netley (Denneoord Primary School) was appointed as assistant trainer. 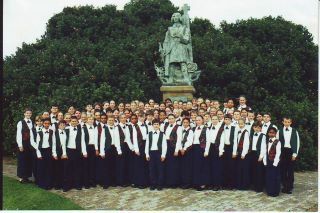 The choir had its debut concert in the Dias Maritime Museum, Mossel Bay, on 8 November 1996, with Gé Korsten as the guest artist. The original logo of the SCCC was designed by Leonard la Grange, an artist from George. In 1997 Amanda Hattingh (Outeniqua Primary School) was appointed as conductor and Ronelle Kruger (Outeniqua Primary School) as accompanist. Amanda conducted the choir for almost 10 years, undertaking concert tours of Europe in 1998, 2000 and 2003! Amanda Hattingh was born in Kimberley (the Diamond City of South Africa) where she grew up and matriculated. She obtained a degree in music (specializing in piano) and a teacher's diploma at the University of Orange Free State (Bloemfontein). 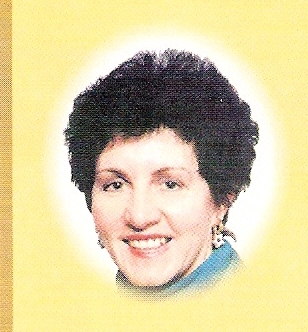 Her active and successful involvement in music, teaching, choirs eisteddfods and musical productions culminated in her being elected as the conductor of the South Cape Children's Choir in 1997. Ronelle Kruger was born, grew up and matriculated in Ceres, a picturesque town surrounded by mountains, in the Western Cape. She obtained a degree at the University of Stellenbosch and also attended the University of the Orange Free State, where she obtained a degree in music and a teacher's diploma. Ronelle taught piano for nine years in Bloemfontein and then moved to George where she is active in various musical affairs. Front Row: , , , Anne Swart, . 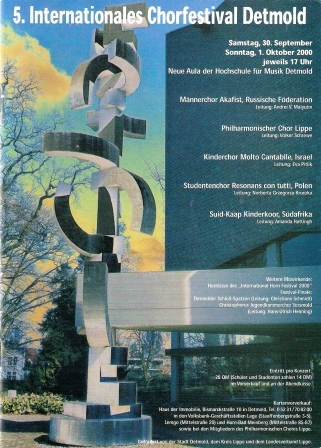 In 2000, the SCCC participated in its first international choral festival, the International Detmold Choral Festival. 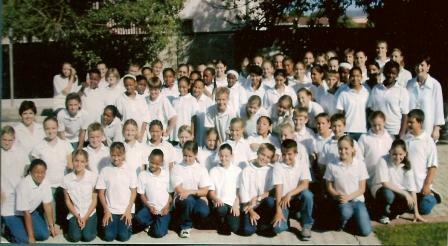 In 2006 the choir was conducted by Susan Hattingh, (George-South Primary School). Click here to go to the next "Our History" page.